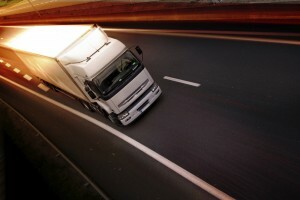 Posted in Tractor Trailers | Comments Off on What is a Jack-Knife Accident? What Is Ice Road Trucking? If you’re familiar with the TV show Ice Road Truckers, you probably know about the wild ride that is ice road trucking. And while it may be dramatized on the show, there are definitely real risks in ice road trucking. Ice road trucking is the method that small towns and mining operations in the far north of Canada and Alaska use to keep their camps supplied during the winter months. The northern territories in which these towns are found are filled with lakes, and during the summer months, ferries keep the supply lines open. During the winter these lakes freeze over, making ferry transport impossible. Instead, the snow is plowed off the surface of the frozen lakes and exposed to the sub-freezing air, which can reach temperatures of negative 60 degrees Fahrenheit. This makes the ice under the plowed areas very thick and allows it to support the weight of semi-trucks. Ramps are built to connect bodies over water over land using a frozen mix of snow and lake water. The trucks can then use this icy highway to deliver supplies where they are needed. Naturally, using ice as a construction material for a highway has its drawbacks. 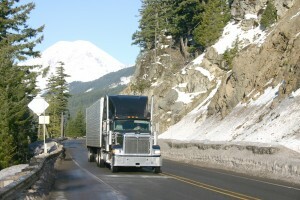 Speeds are limited to about 15 miles per hour, though some truckers exceed this at their own risk. The mass of the truck can actually create waves below the surface of the ice which can cause it to break away from shore. Expansion and contraction due to temperature changes can create large cracks in the ice. Highways that pass through mountainous regions are vulnerable to avalanches. Because these highways pass through such remote locations, it can be difficult and time consuming for emergency responders to arrive in the event of an accident. Overall, ice road trucking isn’t for the faint of heart. However, it is the most cost efficient method of delivering supplies to these high-latitude towns and mining operations. Posted in Freight Shipping | Comments Off on What Is Ice Road Trucking? Winter weather can bring dangerous road conditions that make safe driving even more of a priority. While you can control the weather, you can control how you prepare for it. 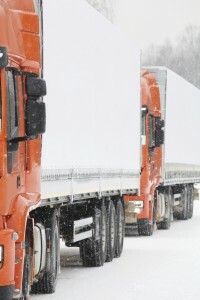 Here are some tips for truckers that will help with preparation for winter weather. When the weather is good take note of safe places to park and places to chain up and chain off. Keep these locations in the back of your mind, or better yet, write them down, so when you need to make an emergency stop you know where you can go. These days you can use lots of different sources to keep tabs on the weather, from your radio to your smartphone. Check the forecast before you go and make a plan for your trip. If snow is in the forecast, calculate your speed at 25mph in order to avoid running out of driving hours or hitting them before you can get to a safe spot. You can only take advantage of the “extra two hours of driving for unforeseen traffic or weather” if it is unforeseen. If you knew about bad weather ahead, use of these hours won’t fly with DOT. Make sure all lights work and are clean. Draining air from the truck’s tanks and trailers will reduce the chance of condensation building up in the air lines and freezing your brakes. Make sure you have the proper equipment for chaining in bad weather conditions and personal equipment to keep you warm if you’re waiting for a tow. Safety is the best policy. If you’re inexperienced with the weather conditions ahead, better to pull over and wait for the plows and salt trucks to come through. Or look for a mentor with more experience who can guide you through.